I am a software developer working for the Texas A&M System since 2004. 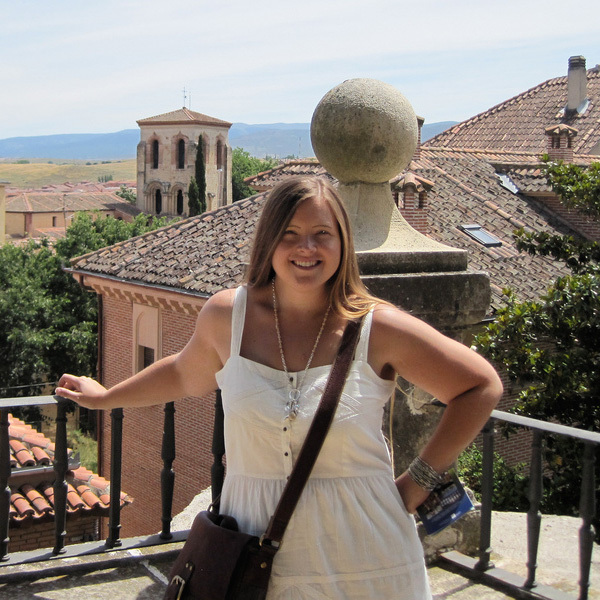 I work for the Spatial Sciences Laboratory in the Department of Ecosystem Science and Management in College Station, Texas. I primarily develop complex web applications using ASP.Net C# and MVC that interface with the Soil and Water Assessment Tool (SWAT Model). The following projects are a sample of the work I do for the Spatial Sciences Laboratory. 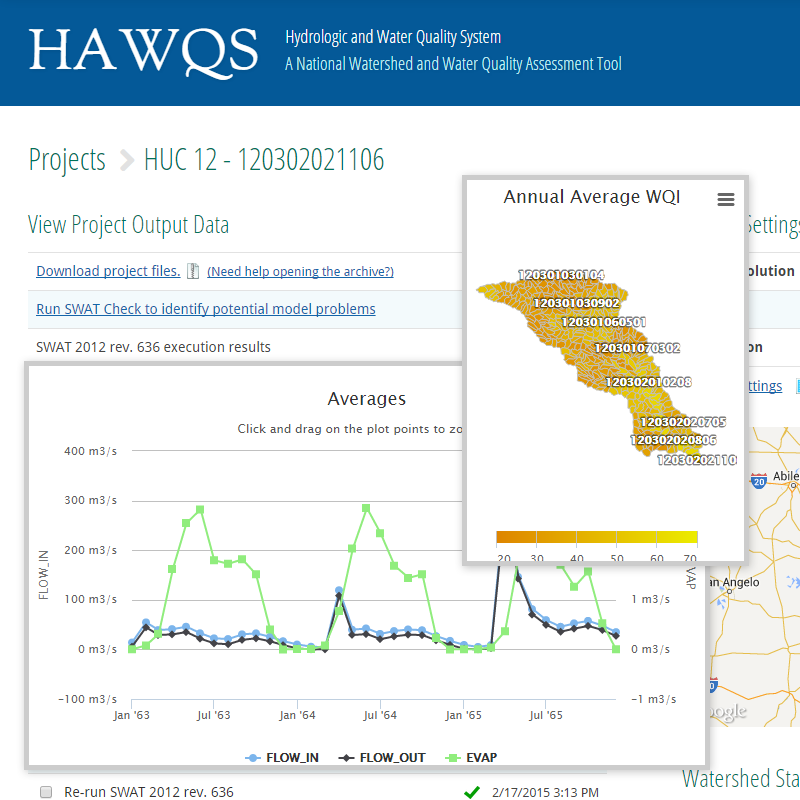 HAWQS is a national watershed and water quality assessment tool that serves as a web interface for the Soil and Water Assessment Tool (SWAT). HAWQS contains SWAT parameter data for the entire continental United States in three catchment resolutions: HUC8, HUC10, and HUC12. Users create a project by selecting their watershed and catchment resolution from a Google map then specifying their SWAT model simulation dates and timestep. After a project is created, a user may set HRUs to eliminate minor land uses, soils, and slopes as well as modify SWAT input and output parameters. The user may then generate model input files and databases, run the model, analyze results through a series of maps and charts, and download all project files. Technology: ASP.Net C# MVC, multi-threading, MSMQ, Entity Framework, SQL Server or MySQL backend, Google Maps API, GeoJSON, Highcharts, jQuery, CSS3, HTML5. The SWAT website utilizes a responsive design and is run using the Umbraco content management system (CMS), an ASP.Net CMS with a SQL Server backend. 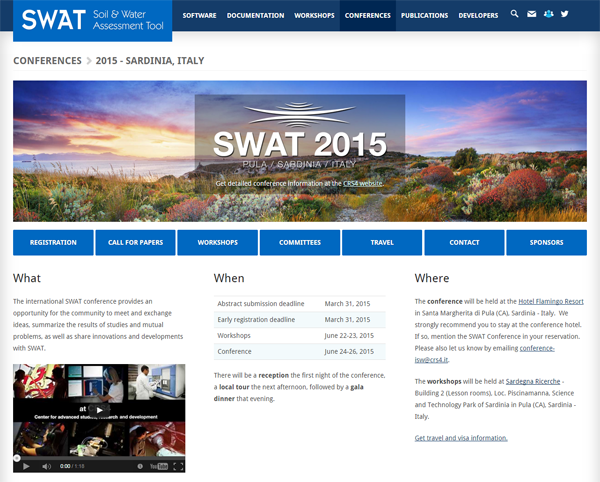 In addition to the website, I help organize and coordinate the international SWAT conferences held around the world each year. The 2013 conference held in Toulouse, France drew nearly 200 attendees from 35 countries with more than 170 oral and poster presentations on the model. This year the conference will take place in Sardinia, Italy. Participants may submit an abstract of a paper they wish to present at the conference through the SWAT website. The scientific committee receives a notification when a new abstract is submitted, and logs into the website to review the abstract. This integrates with our online conference registration system allowing me to generate conference documents such as receipts, invoices, invitation letters, agenda schedule, presentation and award certificates, and more, eliminating a lot of tedious work that often goes into preparation for such a large event. I also manage the mailing lists and social media accounts for SWAT and the conferences. Technology: ASP.Net C# MVC, Umbraco, Entity Framework, SQL Server, jQuery, CSS3, HTML5, Mailchimp, Facebook, Twitter. Global Weather Data for SWAT is a web application that allows users to gather daily weather statistics in SWAT and CSV file format from a MySQL database containing 35 years of hourly temperature, precipitation, wind, relative humidity, and solar data around the world. Due to the amount of data, hourly statistics are compressed into BLOB fields, one month per row with each hour comma-separated in the BLOB. Users select a rectangular area from an embedded Google map and the tool queries the database, aggregates hourly data to daily, performs necessary calculations, and converts units. To properly handle the quantity of data, the tool using a multi-threaded MSMQ solution and emails the user when their request is complete. The National Air Quality Site Assessment Tool (NAQSAT) provides assistance to livestock and poultry producers in determining the areas in their operations where there are opportunities to make changes that result in reduced air emissions. NAQSAT is an expert decision system that takes a user through a series of questions spanning 8 categories. The application features question-chaining where questions presented to the user are based on previous choices. NAQSAT provides users with a graphical representation of their score for 6 emissions upon completion. The Whitney and Aquilla Lake Hunting Program is an online hunting permit management application. Hunters register for a permit online, as well as submit hunting activity and photos. Hunting activity is compiled into seasonal success reports made available to the public. The application utilizes an administrative back-end for lake office employees to manage hunters and website content. MRASED houses data collected via CWA 319(h) Grant Program funds allocated to and through the Texas State Soil and Water Conservation Board (TSSWCB). The online application was developed for use on a Debian 6.0 Linux machine housed with the TSSWCB. The application allows administrative users to enter project summary information, upload associated PDF documents, as well as pipe-delimited data files. The public interface allows users to search projects and data by text or location by selecting a point and radius distance on a Google map. The Water Quality Management Plan (WQMP) application allows Texas State Soil and Water Conservation Board (TSSWCB) employees to efficiently enter and update WQMPs across their five regional offices, as well as gather useful reporting statistics and generate documents and reports. In addition to WQMPs, the applications stores customer data, status reviews and complaints. Administrative users of the application may track conservation practice priorities for the five areas, as well as funds allocated to each area in a fiscal year and how those funds are being allotted in WQMP cost-share assistance. SWAT Check is a desktop application that reads model output from a SWAT project and performs many simple checks to identify potential model problems. SWAT Check was originally developed by another programmer using ASP.Net VB, and was re-written by me using C#. The re-write moved to an object-oriented approach for reuse purposes and readability. The code is split into separate code libraries so that code may be reused in the HAWQS web application. The application is updated frequently to keep up with changes to the SWAT model. I do not do freelance consulting. However, if you have questions or want to talk about a project with the University, please contact me at jaclynt@tamu.edu.